Drake‘s been in a giving mood this week, and one of his 5-figure gifts will help women and children in Miami for years to come … TMZ has learned. Drizzy dropped by Lotus House — Miami’s only shelter for homeless women and children — and dished out toys and games to 140 kids Tuesday. He also handed out $150 Target gift cards to 130 women, and cut a $50,000 check for the organization. We’re told the money will go directly toward funding the group’s new shelter, which recently opened and holds 500 beds. 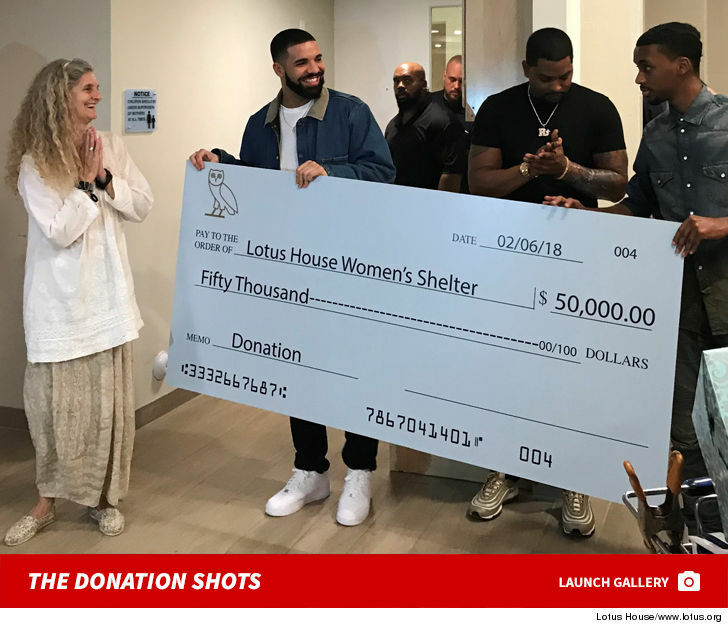 Lotus House President Constance Collins told us the “God’s Plan” rapper’s donation will “nourish bodies, minds and spirits of homeless women and children who are among the most vulnerable in our community.” She added … Drake’s timing is perfect. Drake’s charity spree has also included spending $50k on groceries for random Miami shoppers, a $50k donation check to one happy student at the University of Miami and $25k to a high school.